InfoShield’s shredding trucks are equipped with cross cutting technology and can destroy up to 5000 lbs. of paper per hour, which equates to about 300 lbs. of paper in 3 minutes. This means faster service and savings for our customers. Our mobile shredding trucks meet or exceed all Federal and State privacy legislation requirements. Witnessed destruction of material is always available via our on-board video monitor clearly displaying the shredding process of deposited paper. What happens with the paper once it’s shredded? 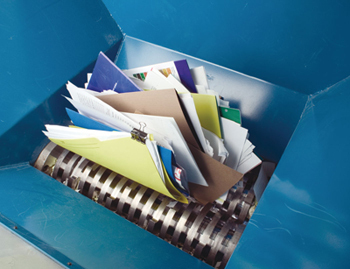 Once the truck is full of your shredded documents as well as several tons of other InfoShield client material, it heads to the recycling plant where the pulverized paper is unloaded and comingled with other recyclable material. It is then compacted and baled and sent to paper mills for processing into commercial paper products. Americans use over 67 million tons of paper each year, or 600 pounds per person. Each year over 900 million trees are cut down to provide raw materials for American paper and pulp mills. Producing recycled paper requires about 60% of the energy used to make paper from virgin wood pulp. What are the Security Implications of Improperly Disposing Confidential Data?